Chalk up another Web 1.0 movie delivery service to the fire-sale files. Last year, it was Blockbuster stepping in to salvage Movielink for pennies on the dollar, $6.6m to be precise. This year it’s Sonic Solutions sweeping up CinemaNow for even less. Announced Thursday, the media authoring software company known as a leading maker of DVD and Blu Ray encoding tools is buying the assets and assuming the liabilities of the movie download service for a reported $3m. Cinema Now was founded in 1999 to offer online movie rentals. As studios became more accepting of Internet delivery mechanisms, downloadable sales were added to the mix. CinemaNow was the first website to offer pay-per-view movies from major studios. They were also the first broadband distributor of HD content. Investors including Menlo Ventures, Cisco, Transcosmos and Lions Gate fueled the company with more than $40m in funding. A fifth round totaling more than $20m was closed in 2006. The investors money helped build both the delivery mechanism and a catalog of TV and film titles more than 6,000 strong but it wasn’t enough to buy a sizable audience. Consumers never really embraced the service. CinemaNow, according to Sonic Solutions (via Variety) had been drawing around $1m in quarterly revenue, a tiny number outpaced by expenses. Lions Gate singly owned in the range of 18% to 21% of the company. Earlier this year, Lions Gate began bundling iTunes-ready digital files with select DVD’s. The major indie producer is also involved in a partnership with Viacom and MGM to launch their own premium TV channel. The combination of divergent efforts effectively signaled CinemaNow was no longer a priority. That view was reinforced when CinemaNow CEO Curt Marvis jumped ship to become Lions Gate’s president of digital media in April. The end of CinemaNow was a foregone conclusion. Once absorbed, Sonic plans to use the property, particularly the film catalog, to try and grow a relatively new “download to burn” service built around their Qflix DVD drives. Qflix drives burn single-layer DVD-Recordable discs with the CSS copy protection system built in. When a movie is downloaded from a Qflix partner site it can only be burned to Qflix-specific DVD media on the Qflix drive. The burned discs have the same encryption as a purchased Hollywood movie disc. They’ll play in a standard DVD drive but can’t be easily replicated en masse. The Qflix drives can be found at in-store DVD purchase kiosks where they theoretically allow a store to sell a massive DVD catalog without needing to allocate the valuable shelf space to inventory. The drives are also being integrated into home PC’s. The first of these studio- approved “burnable in the home DVD” drives began shipping on Dell PC’s in September. CinemaNow joined the push to promote the program by becoming a partner site in late October. Sonic’s EVP of strategy Mark Ely will run a new “premium content group” when the acquisition is complete. 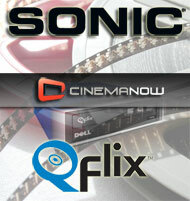 The group will house both CinemaNow and Sonic’s Qflix team. CinemaNow pres. and COO David Cook will take the role of GM. Current CinemaNow CEO Tom Frank will exit. The saying is that the early bird gets the worm. In reality, there’s such a thing as being too early. Movielink and CinemaNow were both victims of poor timing. We’ll now see if Sonic is better equipped to deliver. Print-On-Demand kiosks offer a compelling value proposition to retailers – if consumers accept and use them. •Blockbuster Looking at a Download Service with Movielink Assets?